While the GOP is mostly on defense, the playing field is significantly narrower than it has been in previous cycles. Republicans are defending 22 seats, compared to just 12 for Democrats. But only two GOP seats are in states Trump lost in the last presidential election, and only a half-dozen GOP senators appear vulnerable at the outset of the cycle. Democrats need to net at leastthree seats to retake the majority — four if they lose the presidency again— leaving them clear paths to retake the chamber but little margin for error. Every Senate Republican incumbent in a battleground race raised more than $1 million in the first quarter of the year, a benchmark number puts them in strong position at the outset of the cycle. Five incumbents upforreelection— Sens. 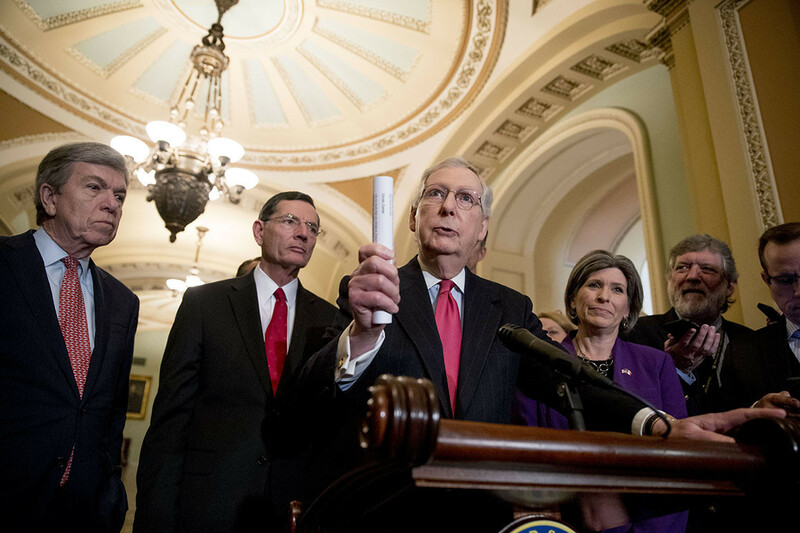 John Cornyn of Texas, Cory Gardner of Colorado, Martha McSally of Arizona, Lindsey Graham of South Carolina and Majority Leader Mitch McConnell of Kentucky — topped $2 million in the first quarter. Democrats have had early success, as well. Sen. Doug Jones of Alabama, the most vulnerable senator on the 2020map fromeitherparty, has $3.1million in the bank and can build a head of steam for his uphill reelection in the heavily red state while the Republican primary field remains unsettled. (His first GOP challenger, Rep. Bradley Byrne, has $2 million in the bank). Three other Democratic incumbents Republicans hope to target allhauledinmorethan$1million:Sens. Gary Peters in Michigan ($1.9 million), Jeanne Shaheen in New Hampshire ($1.4 million) and Tina Smith in Minnesota ($1.1 million). And Mark Kelly in Arizona, Democrats’ top recruit so far this cycle, raised $4.1million, doubling McSally and ending the quarter with $1 million more in the bank than the appointedRepublican incumbent. Republicans expected Kelly to post a massive first-quarter haul but are watching closely to see if he can sustain it in the next three months. In Colorado, former state Sen. Mike Johnston led the way for Democrats by raising $1.8 million, only narrowly trailing Gardner, while former state House Speaker Andrew Romanoff raised $500,000. Two other Democrats also entered the race this week. For now, the main thing missing for Democrats is candidates. Kelly is considered a top recruit in Arizona, anda slew of candidates in the primary to take on Gardner. But, so far, Democrats don’t have any top-tier candidates in Iowa, Maine,North Carolina or Georgia, where Stacey Abrams is still weighing a bid and is still being heavily recruited by Minority Leader Chuck Schumer (N.Y.) to run against GOP Sen. David Perdue, who raised $1.8 million in the first quarter. In Texas, veteran MJ Hegar and Rep. Joaquín Castro are both considering running againstCornyn. But either candidate would face a steep fundraising gap with theincumbent, who has outraised every other incumbent senator from both parties and stockpiled $7.4 million — close to $3 million more than Ted Cruz, his Texas colleague, had at this point in 2017 before facing a surprisingly spirited and well-funded challenge from then-Rep. Beto O’Rourke.